Do you ever wear clothes just simply because they make you feel good? I consider these pants my "comfort pants" - if I'm having a bad day, or am not feeling so good in the "lady department" if you catch my drift, or just need a pick me up, these pants are my first choice. And after an emotionally draining day yesterday, today I was seeking something comfortable. Of course, it doesn't hurt that these pants are also cute and they are my favorite pattern in the world! I adore these pants. I can't say enough about them. If I wasn't already married to the Pants Monkey I'd marry these pants...ok, maybe that's going a bit too far. At any rate, it is nice to be back to a normal routine again. And I have to say, it's also nice to come to work today knowing I only have to work today and tomorrow and then it's the weekend already! You know what else is nice? Outdoor pictures! It was definitely light enough today and I just went for it. Chilly out there though! Tomorrow morning I hear it will be only in the single digits so we'll have to see how daring I feel! Yes those are leaves still on the ground from this fall - if you didn't know any better you'd probably think it actually was fall by looking at these pictures! We kind of figured the snow would have killed off all the leaves and such by now but that didn't happen this year! I think we'll have a lot more clean up this spring than we usually do in our yard! I'm looking forward to catching up on other blogs today! Also - I just noticed I hit 25 followers in GFC - thank you all who have followed me there or via Bloglovin, I appreciate it so much and have had so much fun getting to know all of you! If I'm lucky enough to reach 50 sometime I just might do a giveaway, we'll have to see how things go! Honestly I just have so much fun doing this, it's icing on the cake that others enjoy it as well. Hi Bethie - those pants look great on you! You crack me up about the "lady department"!!! 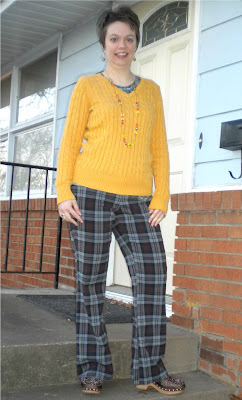 I've never had a pair of plaid pants before except PJs! The yellow top is great too - a real "Eye Catcher" - come and link up with me today if you can! These pants are amazing! Love them! Way to rock plaid. Thanks for the link! Her pants are so cute! Thanks for the comment doll! I was hoping you would link up with me for my new Eye Candy feature. It will be open for the next few days so if you get a chance, come back and link up - thanks! Comfortable clothes always make me feel the best. Isn't it crazy to look at your pictures and not see snow? Those are some great comfort pants! It's nice to have comfort pants that don't LOOK like comfort pants, you know? Yes, I hear tomorrow is supposed to be quite chilly up here too...I don't plan to go out all day. I have the ability to do that, and I like it. it definitely helps to have those comfortable outfits you can pull on when you aren't up to much thinking or planning! have a great friday!